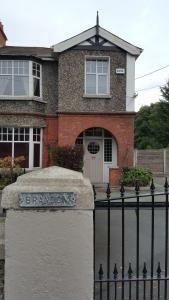 Xem tất cả 1.395 khách sạn tại Dublin. Nằm công viên cảnh đẹp rộng 240 mẫu Anh, Citywest cung cấp 764 phòng ngủ, câu lạc bộ chăm sóc sức khỏe và du lịch giải trí, sân golf 18 lỗ cùng nhiều quán bar và nhà hàng ngay trong khuôn viên. WiFi và chỗ đỗ xe miễn phí cũng có sẵn tại đây. Mỗi phòng nghỉ rộng rãi và hiện đại đều có phòng tắm riêng. Trong phòng được trang bị TV, tiện nghi pha trà/cà phê và bàn làm việc. Một số phòng có tầm nhìn quang cảnh tuyệt vời, đồng thời chỗ nghỉ cũng cung cấp dịch vụ báo thức. Câu lạc bộ chăm sóc sức khoẻ và du lịch giải trí Citywest có phòng tập thể dục lớn, hồ bơi và spa với bể sục, phòng xông hơi khô và phòng xông hơi ướt. Du khách cũng có thể sử dụng dịch vụ tại Haven Hair & Beauty. Woodlock Brasserie phục vụ đồ ăn tươi trong không khí thoải mái, với sự kết hợp các món ngon nhất khắp Châu Á. Pavilion Lounge phục vụ đồ ăn nhẹ và đồ uống nóng trong khi quán bar Swift phục vụ nhiều loại cocktail và các loại rượu whisky quý hiếm của Ai-len. 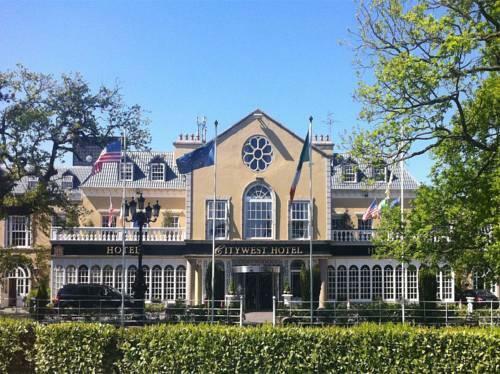 Citywest Hotel và Resort 4 sao nằm ở vùng ngoại ô của thành phố Dublin và có lối đi thuận tiện ra đường cao tốc M50. Điểm đến du lịch Guinness Storehouse cách chỗ nghỉ 20 phút lái xe và Khu Kinh doanh Baldonnell cách đó 10 phút đi xe hơi. I enjoyed my stay at the Citywest Hotel. The staff were very friendly, there was excellent live music and the facilities were excellent. Location wise, however, it is not ideal if you are going to the Aviva Stadium (as I was) or any other major venue in the city centre. The Luas as not running to Saggart so shuttle buses were provided. This was not ideal, as it involves a lot of hopping on and off buses. The room was excellent, the shower was good and the beds were first class. There are lots to do for children, such as a games room. The lifts were very hit and miss and need to be serviced more often. 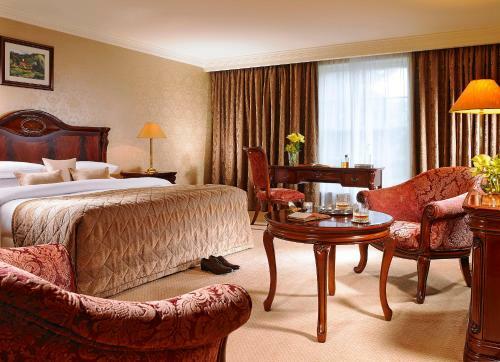 Overall, an enjoyable stay and I would recommend the Citywest Hotel to anyone who is planning a long stay in Dublin that does not involve a sporting event. Disappointing. Our room was very unexpected to what we thought we would be getting and compared to every other hotel we have stayed in before. We are a hotel couple. We had to ring down for pillows and extras as there was barely anything in the room. Very uncomfortable bed. When we went for brekfast the next morning, it was like a wedding reception, loads of big tables for 10. We couldn't sit alone which was so disappointing so we left and had to go eat somewhere else after checking out. We will not be returning to this hotel again! Relaxed great staff. Breakfast hot bad could not eat but did not get charged. Complained. Bar good fun. Just one night. Old fashioned bathroom. Beautiful bedroom,friendly staff, good atmosphere! 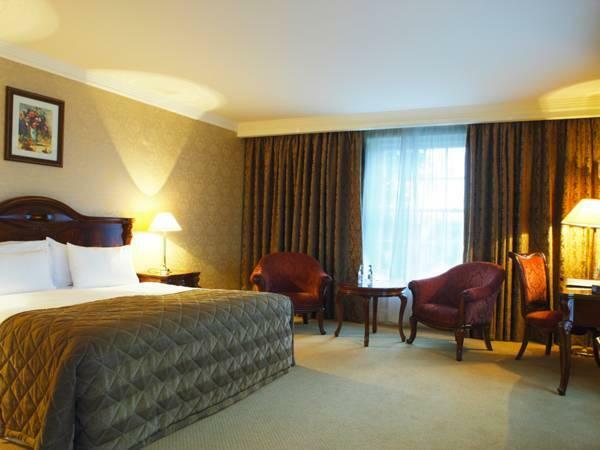 It's a great hotel and easy access to the city centre via the luas which is a few mins from hotel! 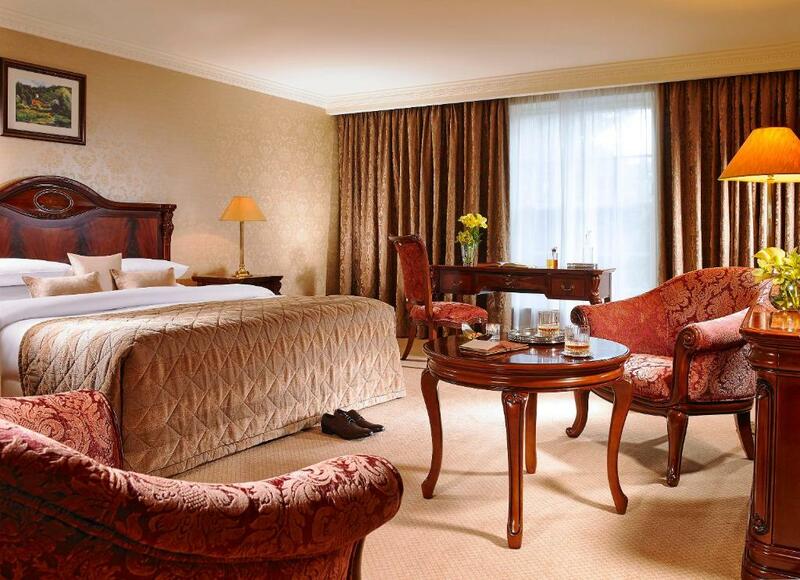 we have stayed at the citywest before and have always been impressed. the rooms are excellent and the hotel facilities first class. this coupled with value for money make the citywest a good option. my daughter was participating in a dancing competition which was held in the hotel. the staff were extremely helpful and efficient. food good also, plenty of choice and service with a smile. ideal for families with children, business or couples. Very enjoyable stay, with good breakfast choice. No noise and beautiful surroundings. Overall the stay is good if you like golf or you come here for business trip in the Citywest Business Park (which is 5 min away from hotel). 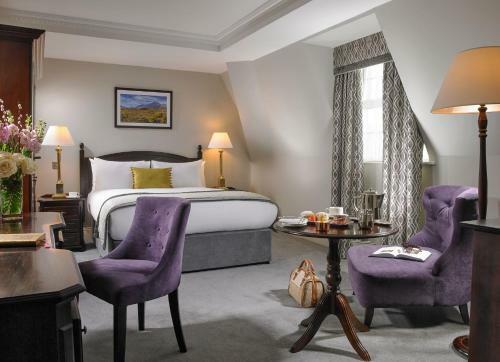 However if you are here to tour around Dublin, the hotel location will cost you EUR 30 cab fare each trip to and back from city center. The accommodations were nice. The staff were friendly and helpful. The grounds were beautiful. I would recommend going into the town outside of the CityWest and exploring the shops and restaurants. Delicious food both at the CityWest and off property! The Irish breakfast at the hotel was lovely and very filling. Beautiful hotel, grounds and rooms. Lots of resturaunts, bars and bistros to choose from on property. Friendly service. Busy hopping place. Lots of fun going on. Party on floor below was very loud until after 3:00 in the morning, screaming in lobby, fight broke out and police had to be called, didn't get much sleep, had to be up early for flight home, not fun. I had a great experience with CityWest Hotel in Dublin. Even though I am not satisfied with the internet, that was offset by the other good things. I was satisfied with the price first. Then the quality was good with beautiful scenery of golf course. If we want to use public transportation from city center, you can take a 69 bus with only 2 Euro. If we take a taxi, it will cost about 30 to 40 Euro depending on the traffic congestion. Je suis à arrivée à 18 h30 à Dublin, heure locale, et j'ai voulu donner mes papiers, de réservation, avec mon nom et prénom. On m'a dit que ce n'était pas la peine, et ensuite on m'a réveillé à 22 h 00, le soir même par téléphone dans mon lit, pour me demander de descendre à la réception, pour payer ma note d'hôtel. Je n'est pas apprécié. La salle de bain, il manquait un support pour poser ces affaires, je n'arrivais pas le jour suivant à ouvrir, le robinet de douche pour avoir de l'eau, j'ai fait appel à un réparateur, pas de brosse pour nettoyer les toilettes, ni les parfumer. Pour la chambre, l'amoire, il manquait une poignée, le lit c'était 2 lits d'une personne sur roulette, qui bougeait tout le temps, les draps étaient troués, les carreaux sales des fenêtres, il n'y avait pas de réfrigérateur, et les chaînes de la télévision était impossibles à regarder, c'était brouillée, cela sautait, les voix était métallique. Et pour aller en ville, il fallait marcher pendant 20 minutes dans un chemin bordé d'arbres avec peu de lumière et prendre un Tramway pendant 40 minutes. Et au retour, comme je ne savais pas, il faut changer de tramway, à une station, pour aller dans la direction de l'hôtel. Donc, conclusion, arriver au terminal, j'ai du reprendre un tramway dans l'autre sens, et m'arrêter 4 stations plus loin, pour reprendre un autre tramway. Et marcher presque dans le noir, avec mon téléphone portable, et la lampe torche. Service aan de receptie was vriendelijk en vlot. Het is een hotel van behoorlijke omvang. Tijdens ons korte verblijf werd er een groep gestrande reizigers opgevangen; vlucht geannuleerd. De organisatie van het hotel paste zich daar snel op aan. Omvangrijke groepen zijn voor dit hotel kennelijk geen probleem. Stijlvolle inrichting. Kamers zagen er goed, schoon en verzorgd uit. Internet, bedraad, werkte probleemloos. Diner gebruikt in de bistro. Daar zaten we niet alleen. Ook daar was de organisatie goed, geen onnodige wachttijden. Het eten was heel behoorlijk, goede prijs / kwaliteit. Op prettige afstand (20 km) van de luchthaven, het hotel is goed bereikbaar.